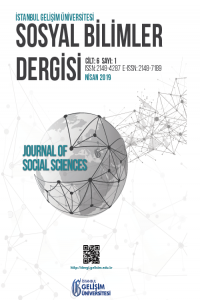 Istanbul Gelisim University Journal of Social Sciences (IGUJSS), is an international peer-reviewed journal and will be issued biannually in April and October. The journal is indexed by organizations such as ULAKBIM TR Directory, SOBIAD, Ulrich's, PROQUEST, EBSCO. In our journal, scientific articles within the framework of the topics of POLITICAL SCIENCES, BUSINESS, ECONOMICS, ADMINISTRATIVE SCIENCES, PUBLIC RELATIONS, PHILOSOPHY, STATISTICS, LOGISTICS, SOCIOLOGY, PSYCHOLOGY, COMMUNICATION are accepted. Scientific articles with LAW, ARCHITECTURE, FINE ARTS, EDUCATION, LINGUISTICS, LITERATURE, ARCHEOLOGY, INFORMATION TECHNOLOGY and HISTORY are not accepted. There is no Article Processing Charges (APCs) or article submission charges application in our journal.